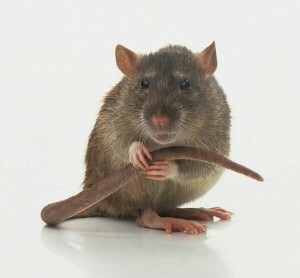 The roof rat, also known as Rattus rattus, is nature’s acrobat. It can climb trees, run along fence tops and tightrope-walk on phone and power lines. It can squeeze through cracks and holes in siding, eaves and foundations. No wonder it is the most common pest animal in the state of Florida. Also called the fruit rat and the palm rat, this rat is common all over the globe. Because they are nocturnal, they may go unnoticed at first, except for the occasional scratching noises in attic spaces. In Florida, where fruit and palm trees are common in residential landscapes, the fruit rat and palm rat makes its presence known when fruit ripens. The surest sign of these rats is hollowed-out fruit. Eliminating access to the attic and roof is one of the ways to prevent roof rats from getting in. Baffles can be placed on power and telephone lines, and trees near the residence can be cut back. A single female roof rat can produce up to five litters of five to eight pups per year. Once established, their population explodes, especially when natural predators like snakes are not present. At the first sign of this animal in the attic or yard, homeowners are well-advised to call an animal control specialist. Our expert services include trapping and removing rats, and preventing their return. Remember: Noises in attic spaces usually mean that property damage and the risk of disease are not far behind. When you smell a rat, call us!